Dreaming of that perfect bloggers bedroom? Well you can achieve that look with Brabantia’s new Linn collection. The new stylish Linn Laundry collection is multi functional and doubles up as a place you can dry your laundry and also store your clothes. The matching aluminium clothes hangers and foldable laundry basket work well for both wet and dry clothes. You can organise your clothes beautifully and show them off which is handy for outfit preparation for the week ahead. The shelves are height adjustable and offers extra drying space. The non-slip base will protect your floor and keep everything sturdy. 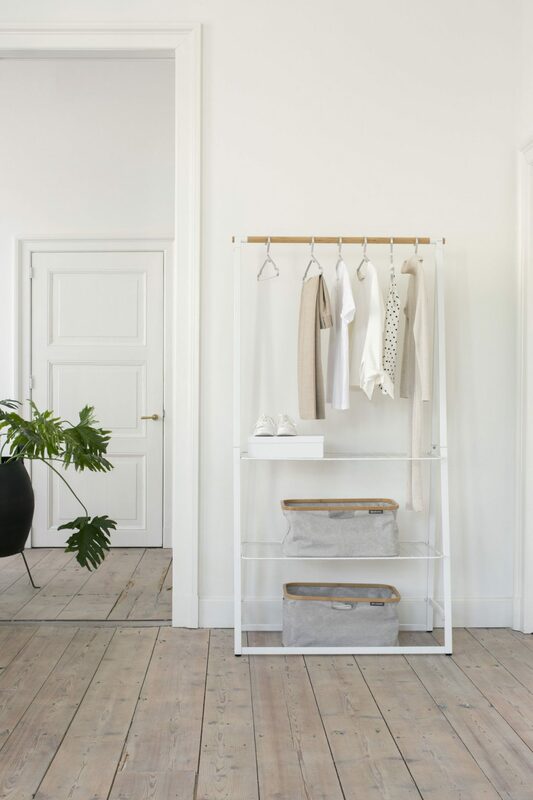 The Linn Clothes Rack comes in two sizes, Small (60 x 57 x 190 cm) and Large (99 x 57 x 190 cm). It is easy to set up, low maintenance, and comes with a 5-year guarantee, and Cradle-to-Cradle Bronze level certified. The minimalist aluminium clothes hangers match the Linn Clothes Rack both in beauty and in usefulness. These handy hangers come in a set of 4 in a colour choice of black or silver. They have clever notches for hanging clothing with straps. But more importantly, they are made to fold into your shirt, so no more unbuttoning or stretching the fabric! They come with a 2-year guarantee and service included. I personally cannot wait to style this beauty in my home and have my favourite outfits of the season on display. What are your favourite storage solutions? The Linn products are available in store from October 2018.